L'Artisan Parfumeur turns to perfumers Karine Vinchon and Elizabeth Maier (after a long stint with Bertrand Duchaufour) for their newest fragrance Batucada, due out in October 2011. The upcoming release connects two perfumers, but also two diametrically different places of the world; Grasse in France and São Paulo in Brazil, according to their official ad copy. Although Grasse is apparently touted as the origin of the finery of the composition's formula, it's Brazil which serves as the conceptual spatial reference; batucada is a subgenre of samba originating from Rio de Janeiro. It involves a percussionist ensemble (bateria) that is heavily influenced by the repetitive and fast style of African percussionists. Batucada by L'Artisan Parfumeur is a unisex fragrance that involves several Brazilian-influenced notes, at least what is populary considered classic Brazilian references for foreigners: The top expecetdly mixes a Brazilian Caipirinha cocktail accord (lime, cachaça and mint leaves), while the heart evolves around floral notes of tiare and ylang ylang. The drydown consists of base notes of coconut water and marine notes with nuances of sea salt. I do hope that they manage to surpass the lovely Bahiana (Maitre Parfumeur et Gantier) which went that route before. Otherwise, what's the point? 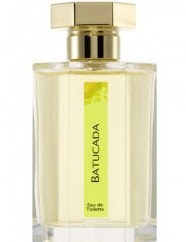 Batucada will be released as an Eau de Toilette in 3.4oz/100ml and 1.7z/50 ml this coming October at select doors who stock L'Artisan Parfumeur fragrances. As a brasilian i must say that the concept is entirely wrong. Caipirinhas dosen't have mint in their composition, and batucada is not a genre of music or a sub genre of samba at all. It's just an expression mining you are hitting a drum. Lartisan showld be more careful when studying the themes of their compositions. Thanks for offering a native's insight! I thought it sounded a little contrived, now I have confirmation. Thanks also for the mention of batucada and the clarification; the guys at wiki have other ideas, it should be changed I guess. Actually, this sounds quite lovely. And your mention of similarity with Bahaina makes me get to the sample I have around... too bad I am already scented! I just wanted to say that, if it contains mint, it´s not a Caipirinha (which I love) but a Mojito (which I don´t like that much). Bahiana is rather lovely, isn't it? I hope more fruities were as pleasurable and non syrupy. yeah, I know... But this is how they gave out the notes (and therefore on announcements I have to follow them, in reviews I'm free to list what I perceive most). Tis right Caipirinha's do NOT have mint but Mojitis do. I love caipirinha's . Hope the perfume is lovely as well! !